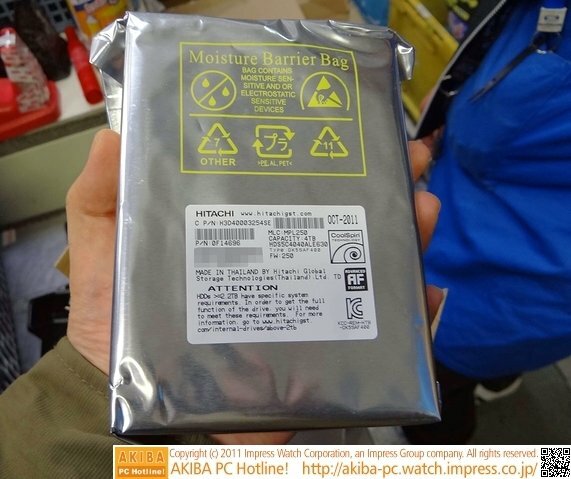 TechPowerUp spotted photos on Japanese tech site Akiba PC Watch of 4TB 3.5" HDDs that have hit Japanese retail shelves. It seems like a 5900RPM unit though. Codenamed HDS5C4040ALE630 and likely part of the Deskstar 5K (we're guessing 5K4000) series, the 4TB drive has yet to be announced by Hitachi but it can be found on sale in Japan, priced at 26,800 yen (~ US $ 345 / 259 Euro). Hitachi's 4 TB hard drive has 32 MB of buffer memory, a SATA 6.0 Gbps interface and makes use of the CoolSpin technology, which means its (likely four) platters operate at around 5900 RPM.